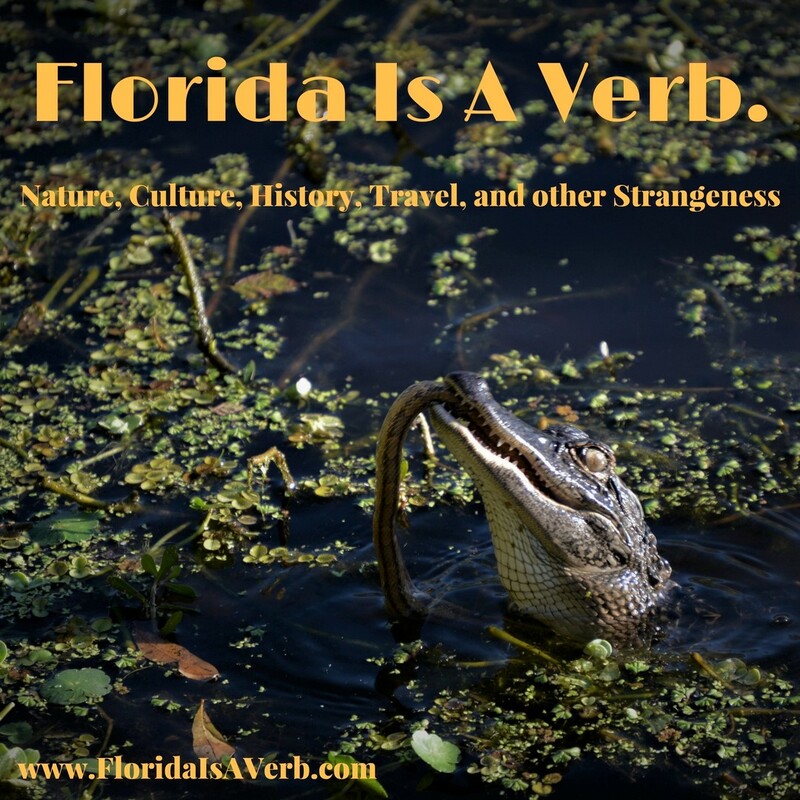 Florida Is A Verb: How Florida Happened Part 2- The Fountain of Youth? How Florida Happened Part 2- The Fountain of Youth? The Fountain of Youth is a myth- but not in the way we most often think. While the idea that Juan Ponce DeLeon discovered Florida when he set out in search of something magical makes for a tidy foundational myth, one that looks good on souvenirs and in the old tourism ads, like much of the history we know off the tops of our heads, it’s a deeply sanitized version. It’s hard to over-state just how apocalyptic the arrival of Europeans was for indigenous people, the combination of disease and colonial exploitation quickly decimated populations. 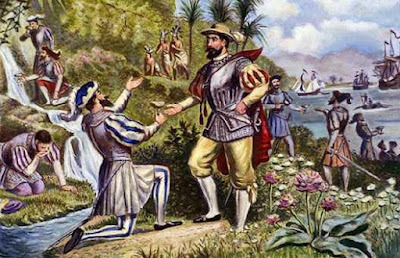 Almost immediately after arriving on island he called Hispaniola, Christopher Columbus set about exploiting the native people and stripping the land of its resources. Juan Ponce De Leon was one of the so-called ‘Gentleman Volunteers’ of Columbus’ second voyage of 1493, which was meant to establish the first permanent Spanish colony on Hispaniola. By 1499, Columbus was deposed as governor due to the brutality of his rule over the island- specifically his use of torture and dismemberment against the Taino people. Columbus was replaced by Francisco De Bobadilla, who had Christopher Columbus arrested and returned to Spain. Bobadilla’s favor among the Spanish Court quickly waned and he was replaced by Nicolas De Ovando Y Caceres, who resumed the brutal subjugation of the Taino. It was Ovando who ordered the Jaragua Massacre in 1503- which led directly to an uprising against Spanish rule. Ponce De Leon was one of the military leaders charged with suppressing that uprising, he carried out a brutal campaign (which included the massacre at Higuey that was later described by Bartoleme De Las Casas as one of the most horrid atrocities committed against native people) and was rewarded with the right to explore and settle the nearby island of Puerto Rico. In Puerto Rico, De Leon continued to subjugate the Taino people, establishing slave labor mines and plantations, and brutally putting down rebellion. In 1511, after a lengthy legal battle, the son of Christopher Columbus, Diego Colon Columbus, successfully petitioned the government of Spain to grant him governorship of the West Indies islands that his father had discovered. Ponce De Leon, displaced from his profitable governorship in Puerto Rico, went searching for yet another land to conquer. Documents show that he was searching, specifically for a place the Taino called Beimini, the home of a wealthy, advanced civilization. There is no mention of a Fountain of Youth in anything related to Ponce De Leon’s voyage to Florida. It’s unclear exactly where Beimini was, though it may have referred to the lands of the Calusa in Southwest Florida, or possibly the civilizations of the Yucatan. He was searching for Beimini, for another land to conquer and more people to subjugate. A romanticized image of De Leon's arrival in Florida in 1513. When Ponce De Leon made his first voyage to Florida in 1513, it is unlikely that his was the first group of Europeans to visit the peninsula. In fact, Spanish colonists had been embarking of slaving expeditions throughout the Caribbean since 1494, and they would have encountered the Calusa people during this time. This would explain why, when the Calusa first sighted De Leon’s ships, they refused to talk or trade. 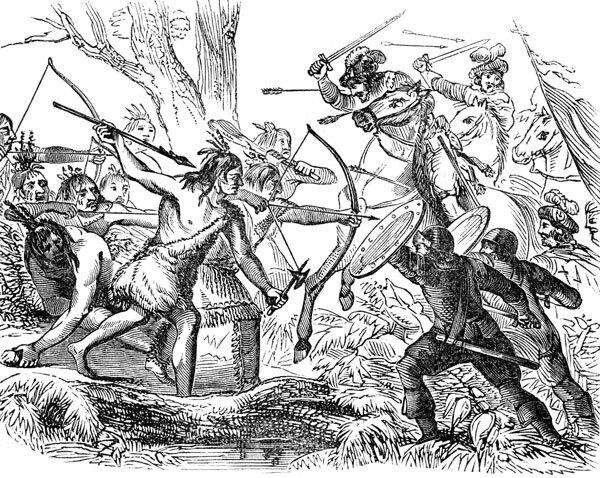 Large sea-going canoes filled with Calusa warriors armed with longbows surrounded the ships and threatened to shoot anyone who tried to come ashore. It’s likely that the Calusa knew exactly who they were dealing with, either from direct experience with Spanish slavers, or from hearing about them from other groups. While this hostile first contact has sometimes been portrayed as a moment of unfounded aggression, in truth the Calusa were responding to an existential threat to their civilization. De Leon’s first voyage hugged the coasts of the Florida peninsula, landing once on the East Coast somewhere between St. Augustine and Daytona (the exact spot is unclear), then attempting to land on the West Coast (where the Calusa stopped them), then landing briefly in the Dry Tortugas (to hunt turtles and seals since they were running low on food) before returning to Puerto Rico. The Calusa attacking the first attempted European settlement on the Florida peninsula. This first voyage was when De Leon named the land La Florida. The name is often interpreted to me ‘Land of Flowers,’ however it’s more likely that the land was named after the Spanish Easter Festival of Pascua Florida, which takes place on April 2, the same date that De Leon first saw Florida’s coast in 1513. He wouldn’t return to Florida until 1521, when he received permission from the Kind of Spain to establish a permanent colony in Southwestern Florida. He landed with 200 people, 50 horses, and everything needed to start a permanent settlement near what is now Charlotte Harbor. 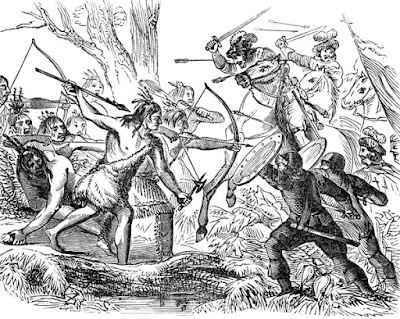 The colonists were immediately attacked by a large group of Calusa warriors armed with bows and arrows. Due to heavy casualties, the attempted colony was abandoned, and De Leon, who had been wounded in the leg, retreated to Cuba. Over a few days what was thought to be a a minor injury inflamed into a blistered mess, and De Leon died in extreme pain. It’s believed that the Calusa had dipped their weapons in the toxic sap of Florida’s native manchineel tree (I want to do a full article on the manchineel because it is INSANE- the sap will burn skin, the fruit will kill, and the smoke from burning the wood can cause permanent blindness). 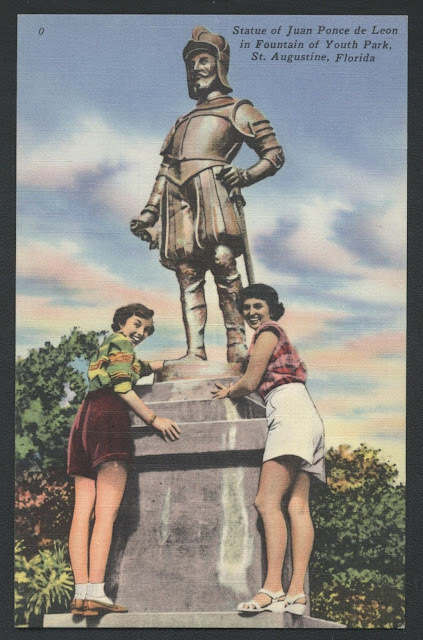 So there’s Ponce De Leon, the one we associate with the ‘discovery’ of Florida, the guy from the postcards. Seemingly, his failed colony and gruesome death kept European powers away from the peninsula for over 40 years, up until the founding of St. Augustine in the 1560’s (which will be the subject of ‘How Florida Happened Part 3’). But of course, something is missing here, that one big thing that is most associated with De Leon, The Fountain of Youth, is nowhere to be found of we rely purely on the history. So where does it come from? The idea that he was searching for The Fountain first shows up about a decade after De Leon’s death in a history by the Spanish writer Oviedo. It’s important to note that Oviedo wrote sweeping romances of the fantastical adventures of made up medieval knights before he turned to writing the history of the Spanish colonies. The story of the Fountain is then repeated by Hernando de Escalante Fontaneda, whose 1570’s memoir of living among indigenous people discusses the miraculous restorative power of Florida’s springs. Here, I think it’s important to note that 16th Century Europeans almost never bathed, and that for a shipwrecked and stranded Spanish sailor- a clean, cool, natural spring almost certainly felt like The Fountain of Youth. The bracing temperature and the skin-softening mineral content of Florida’s aquifer springs also probably contributed to the idea. 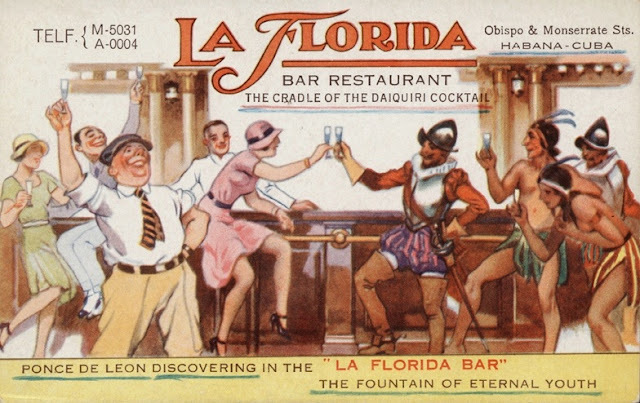 More recent historians have posited that The Fountain of Youth was a euphemism for ‘Bahamian Love Vine’ a plant believed to have aphrodisiac properties, and that Spain’s King Ferdinand The Second, who had recently married a woman 20 years younger than himself, sent De Leon to fetch some. The simplest explanation, of course, is that like much of American History, we tend to prefer versions that make us feel better about ourselves, and sometimes that means making some things up. In the case of Ponce De Leon, it may be that for a lot of Americans it is more comfortable to say he was searching for something magic than it is to say that he lost all his slaves and land to Diego Colon Columbus and wanted to go get some more. For better or worse, we live, partially, within our myths. They’re told and repeated over and over, they change over time to serve different purposes, and sometimes it’s hard to know exactly when to let go. There’s nothing wrong with having myths, in many ways stories can be far more compelling than facts, but it’s important to think about them critically, and to question the purpose that a myth serves. Does it enlighten? Or does it mislead? Nice legs. is that an alligator or a crocodile? I'll disclose to you how you can make similarly shocking or exceptional fountains at home (and that will remain inside your financial plan! ).